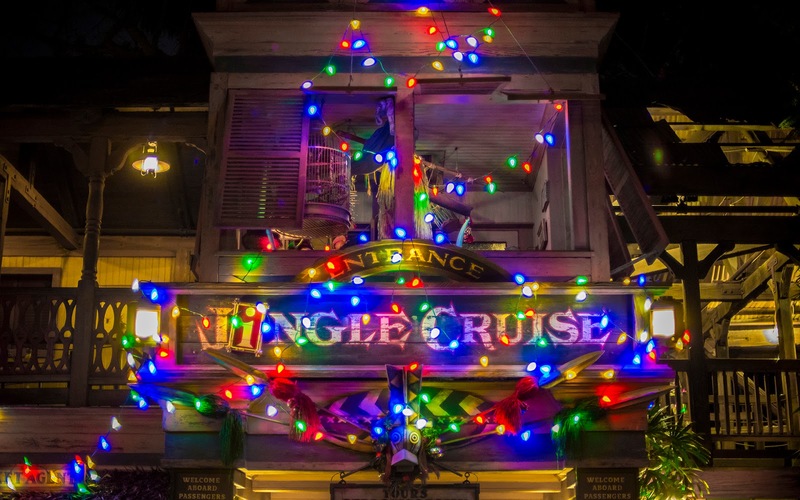 After a moderately successful run last season, the Jingle Cruise is back for a second year during the holiday season at Disneyland. This campy take on the festivities of December has been thoroughly enhanced and is now even more over the top than before, with lots of theming items added throughout the jungle, and a modified spiel to bring only the corniest of holiday jokes to guests aboard the boats. That will be handled in a future blog post. For now, here's a nighttime version of the Christmas-adorned Jungle Cruise station. The luminous and colorful signage of the World Infamous Jingle Cruise.